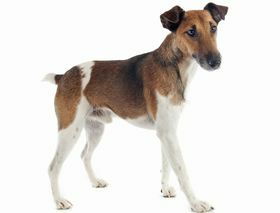 Known for their energetic nature and rambunctious, friendly disposition, the Russell Terrier boasts overall good health. But these pups have a few serious and minor health complications that can be passed down through generations of genetics. Most breeders of the Russell Terrier will extensively test and exam their breeding pairs to ensure sound health of the puppies, but there are no guarantees when it comes to genetics. Plus, Russell Terriers are prone to developing the health issues, such as heart disease and parvo virus, that could plague any dog of any breed from any age. 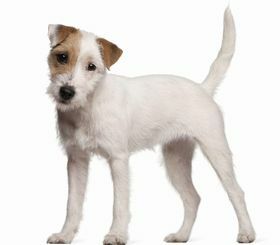 This condition is often a birth defect that leaves a Russell Terrier completely deaf in one or both ears. It is impossible to tell if your Russell Terrier pup will be born with this condition. However, examinations and hearing tests can determine if your pup is deaf after it is born. Deafness usually does not hinder the overall good health and quality of life that your Russell Terrier can have. 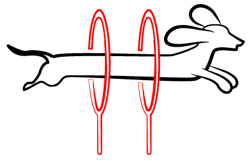 Most owners simply implement visual cues and sign language to train their pups. This condition, also a birth defect, occurs when the kneecap slides away from the groove in the thigh bone. It can be somewhat painful and results in an awkward gait or obvious dislocation. Surgical intervention is required to correct this health problem. If left untreated, this condition results in painful arthritis, nerve damage, and severe cartilage deterioration. Other health conditions that could hinder your Russell Terrier include elbow dysplasia, cherry eyes, progressive retinal atrophy, cataracts, glaucoma, Legg-Calve-Perthes disease, and skin allergies. The average lifespan for a Russell Terrier is between 13 to 15 years. Russell Terriers often think they are bigger than they actually are, so you could say their attitudes are bigger than life. These pups are lively, playful, and stubborn with a natural intelligence and fearlessness. Exercise-wise, these pups are highly energetic, so they need a fitness-minded family to show them the ropes of an active, healthy lifestyle. Go for a run or a long walk with your Russell Terrier 4-5 times a week. This will keep their heart, body, and mind healthy while giving you both ample bonding time. You should still take him for short walks 2-3 times a day to relieve himself outside. Training a Russell Terrier is a bit of a challenge because these pups naturally assume the dominant roles, despite their small stature. 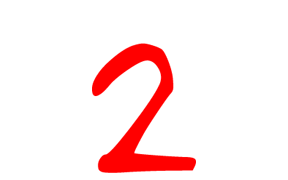 Establish yourself as the leader of the pack with a positive, strong tone in a clear, concise voice. Begin with simple commands, and repeat them as often as you need to until your Russell Terrier gets the hang of following instructions. You might get frustrated at times, but keep a positive outlook and never raise a hand or your voice to your purebred. Always have a treat and plenty of praise ready for when your Russell Terrier complies with your commands. 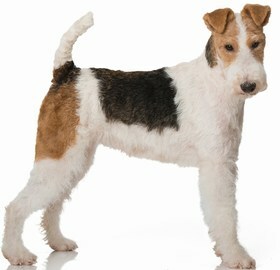 Russell Terriers can have one of several different coat types. Or, some boast a mixture of coat types, with some shaggy parts, and other smooth parts. If your Russell Terrier has a sleek coat, brush him with a soft-bristled brush 2-3 times per week. If he has a somewhat lengthy coat with a few unruly hairs, use a medium-bristled brush to unkink any knots and remove excess hairs 3-4 times a week. You should also bathe your Russell Terrier with gentle dog shampoo every 6-8 weeks, clip his toenails every 2-3 weeks, and brush his teeth daily. He also needs his ears cleaned once a week with a cotton swab and warm water, to stave off infections. Russell Terriers have big appetites, which often leads these pups to obesity and other issues related to being an overeater. It would be easy for your Russell Terrier to make himself sick with kibble, then have a vomit fest all over your living room. Ditch the automatic feeders before your dog turns into an overeater, and put him on a good feeding schedule instead. Divide 1-2 cups of dry, high-quality kibble into two meals per day. This will keep him satisfied without going overboard and putting his health in jeopardy. Looking for a Russell Terrier? 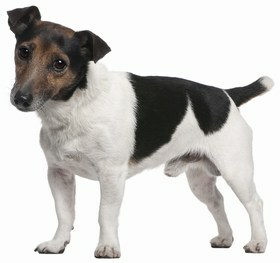 Simple Russell Terriers are a rare breed because people often confuse these pups with Jack Russell Terriers. While similar, the two breeds are different in size, attitude, and lifespan. Make sure you are looking for a Russell Terrier before you search for a breeder. Or, take your search to the local animal shelter. You never know, you might find your new companion waiting patiently in a kennel somewhere. In which case, kudos to you for saving the life of a sweet pup and offering him a new, happy home. If you go the adoption route, fees range from $75 to $250 for starters. This price, of course, varies from state, to county, to shelter, based on regulations and adoption rules. However, most shelters also offer add-on services, such as vaccination updates, health checks, and spay or neuter operations. These services tack on another $200 to $300, so you are looking at an ending adoption fee of between $400 to $550. If you choose to go the breeder route, make sure your breeder of choice is trustworthy, reliable, and reputable. Ask for documents to prove purebred bloodlines, as well as AKC registrations and the health histories of the parent canines. Good breeders will happily, honestly divulge the information you ask for without hesitation. Russell Terrier puppies cost upwards of $800, but that changes with the demand of the pups as trending dogs change. Ranking takes into account a few basic factors including cost, skill level needed, high vs low maintenance and how critical regular training is to success. Russell Terriers earn a 2 on the integration scale, because their independence is both an upside and a downside. On the up, these pups are reliable, lively, and playful. On the down, their level of stubbornness can make it a challenge to train them. Your strategy should be patience, consistency, and determination. When your pup learns that you are affectionate, positive, and repetitive, he will be more apt to follow your example. Obedience and compliance will follow shortly after that, resulting in a well-trained, well-behaved, all-about-family companion.